The Supreme Court has decided to put off hearing the fundamental rights petition filed by former Defense Secretary Gotabaya Rajapaksa, seeking a court order preventing the FCID from arresting him until 27th November as Justice Murdu Fernando has recused herself from the hearing. The former Defence Secretary had filed the FR petition seeking a stay order preventing his arrest by the FCID stating he had been summoned by the FCID to get a statement from him but he fears that he would be arrested. The FCID is probing the controversial MiG deal, the share purchase of Apollo Hospital and the Avant Garde issue. In addition to Justice Murdu Fernando, three other judges have declined to sit on the Bench to hear the F R petition filed by Gotabaya Rajapaksa. They are Supreme Court Judges Eva Wanasundara, Buwaneka Aluvihare andPriyantha Jayawardena. 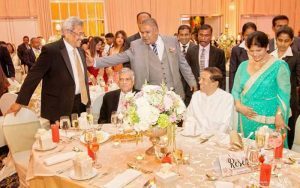 The cabinet including Prime Minister Ranil Wickremesinghe, President’s Secretary, IGP, Director of CID, DIG in charge of FCID have been named as respondents in the FR petition that was filed in May 2015. When cabinet spokesman Minister Rajitha Senaratna was asked about the arrest of Gotabhaya Rajapaksa at a press conference the Minister had said Gotabhaya Rajapaksa cannot be arrested in Sri Lanka and had added that he too was not aware why it was so.